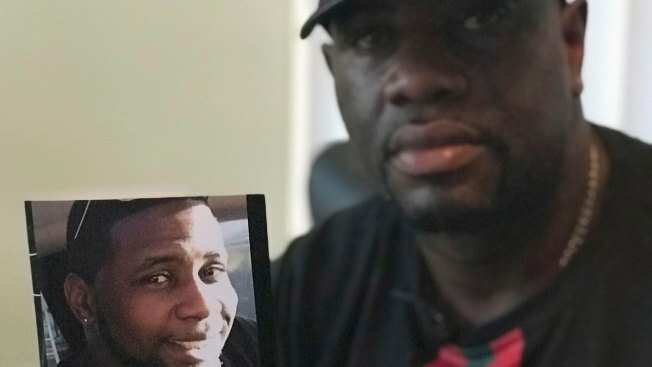 In this Aug. 7, 2018, file photo, Michael McGlockton holds a photo of his son, Markeis McGlockton, in Clearwater, Fla.
Florida authorities on Monday released hundreds of new pages in the case of a white man accused of fatally shooting a black man in a parking lot dispute in July. According to a transcript of Michael Drejka's interview with Pinellas County Sheriff's detectives, he said that if Markeis McGlockton had retreated, or even stayed still, he wouldn't have used his gun. But McGlockton's girlfriend, who was a witness to the incident, said McGlockton moved back. The 70-page interview of Drejka sheds light on his thinking in the seconds before the shooting. Prosecutors on Aug. 13 charged Drejka with manslaughter. He's been released from the county jail on $100,000 bail. NBC 6's Steve Litz speaks to a local lawyer about the "stand-your-ground" law. Surveillance video from July 19 shows Drejka starting a confrontation over a parking space. McGlockton's girlfriend, Britany Jacobs, was seated in the couple's car with two of their children, ages 3 years and 4 months. Jacobs, whose interview with officers was in the newly released documents, said after parking, the 28-year-old McGlockton had gone into the store. That's when another vehicle pulled up and a man later identified as Drejka got out and started looking at her car in the disabled spot, then started hassling her, saying, "'Well, you need to move your car,' and all this and this, you know, 'Cause, you know, I got family that's handicapped,' and all this and this. So, I'm saying, 'Dude, uh, no. I don't know you, so, you know, leave me alone.'" The two exchanged more heated words. McGlockton then came out of the store and knocked Drejka to the pavement. "Markeis came running out and he pushed him," Jacobs said. "He was like, you know -- you know, um, 'Stay away from my girl,' or something, he said. And then all of a sudden, dude was on the ground, and he pulled out a gun and shot him." Said Jacobs: "All he did was backed up. 'Cause, you know, anybody, you know, with a gun pointed at him, he gonna, you know, shut up and not say nothing." Drejka, who is 48, told a detective, "It happened so fast and that was that ... I was literally blindsided." During the interview, the retired tree trimmer said he'd carried a gun since he was 22, and that people parking illegally in handicapped spots at that store was a pet peeve, and that he'd approached people before. "Does it ever go through your mind ... that they might not take that right? That this might go sideways a little bit?" the detective asked. "Um, well, sure. But that's why I take precautions, as well," Drejka said. When asked what kind of precautions, Drejka replied: "Well, I'm a very careful person and I have a permit." In an interview with a local TV station since his arrest, Drejka said that parking spaces for the disabled "have always touched a nerve" because his high school girlfriend and his mother-in-law used disabled parking spots.